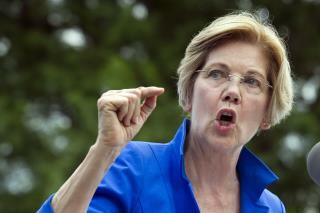 (Newser) – Sen. Elizabeth Warren—and 11 other Democratic senators—introduced legislation Friday targeting credit reporting companies in the wake of the Equifax data breach that affected 143 million US consumers, Reuters reports. In short, the Freedom from Equifax Exploitation Act would keep Equifax from profiting off its own data breach, according to CNN. "Credit reporting agencies like Equifax make billions of dollars collecting and selling personal data about consumers without their consent, and then make consumers pay if they want to stop the sharing of their own data," Warren says. Pocahontas seems to have found a new soap box. Wow. For once in her corrupt little commie life, I actually might agree with her here! I'm still thinking we need the "Free From Faux Native Americans Act"... I'd sign it!